I was looking forward to racing at Square Lake all year. It’s the only race I have been able to do all three seasons I’ve competed and it’s fun to see the improvement. Square Lake was also my first amateur overall win so it will always be a special race for me. 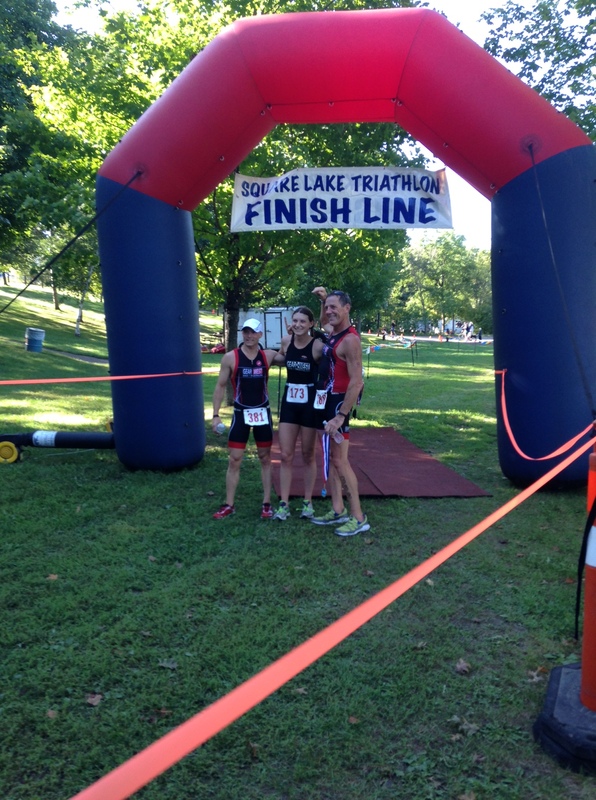 My first year racing at Square Lake was tough; the course is awesome but challenging. For T1 you have to run up a long set of wooden steps to get to the transition area. Then the bike and run course both have some pretty big climbs that are sure to make your legs burn. Having just returned from Edmonton three days prior, I slept in a little more than usual and got to the race as the sun was coming up. It was a chilly morning but the air was warming up nicely. I got my bike setup in transition and headed out for a short bike and run warm-up. With about ten minutes to go I got in my wetsuit and jumped in the lake for a brief swim warm-up. As I got back to the beach Randy announced we’d be starting in 30 seconds; 10 seconds and we were off. Without much time to organize on the beach I was able to get a pretty clean break from the pack since I started wide. I set my eyes on the furthest buoy and got to work. The water was a slightly choppy making it more challenging to get a good breath. Rounding the furthest buoy, we swam parallel to shore to the next buoy and then headed back to shore. At this point I could see I had a decent lead on the pack behind me. I concentrated on sighting; with the sun just coming up over the trees near shore you could barely see the next buoy. I did my best to swim close to each buoy and finally when I reached the shady part of the lake I was able to sight the swim exit. Reaching shore I took a few steps and was running on solid ground. I split my watch on the timing pad right before the climb up the steps. Out of breath from the grueling stair session, I got to my transition spot and out of my wetsuit as quick as I could. I mounted my bike and headed out for a hilly ride. Halfway through the ride, with no warning I hit about a 12-foot section of torn up road covered with gravel. I was going about 27mph at the time so I held on for dear life. Gear West Teammate Julia Weisbecker had warned me about this section but I thought it was later in the course. There were two sections like this so I at least knew the next one was fast approaching. When I sighted the next patch I slowed down and came out of my aero bars, a much safer ride this time. The roads ahead were quite rough and I had to be very careful riding, I would say they were worse than Lifetime Minneapolis. According to race director Randy Fulton, those roads will be re-done next spring making for an awesome surface. The last five miles were tough. Monday’s race in Edmonton was a hilly course, which I didn’t really consider when I came home and did a hill workout on Thursday. 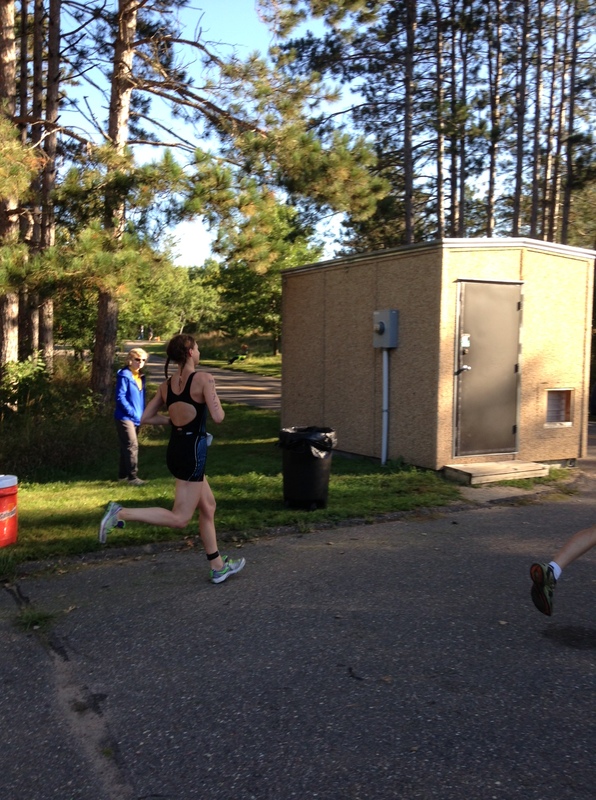 Coming to Square Lake Saturday to race more hills, my legs were starting to feel it. 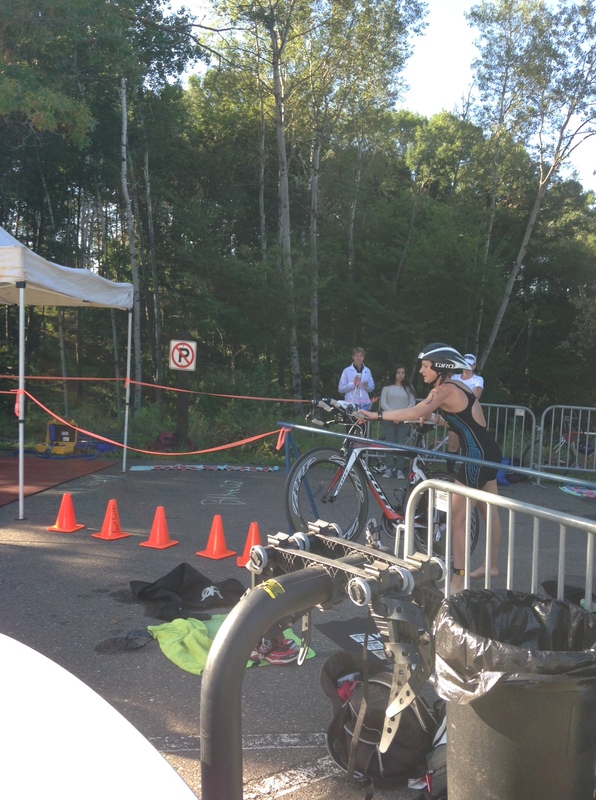 I rode into transition ready to get off the bike. When I got to T2 the volunteers directed me into the run out instead of bike in, I knew it wasn’t right but they insisted. So I had to run a bit further with my bike instead of riding to the other end of transition. When I got to my spot I racked my bike, got my shoes on and ran out to the road. The first male was riding in just as I was exiting, so I was still in the lead. I was looking forward to the run, it’s a hilly run and part on gravel roads but I was looking forward to the challenge. The sun was out but it wasn’t too hot, so it was a beautiful morning for a run. Wearing my new GPS watch for the first time, it buzzed at mile 1; I was 6:20-ish pace and feeling good so I kept at it. The first mile was fairly flat but gravel roads and hills were ahead. The next few miles buzzed by on my watch and I was happy to see that, somehow, I was still making 6:20-ish pace. Hitting mile four I was surprisingly still feeling good and with a mile to go I pushed it as much as I could. At the last big climb past the park my family was cheering me on as I made my way back to the park; which was great motivation for the last bit of the grueling climb. I turned into the park, running past transition I looked to see if anyone was coming behind me, no one was in sight. 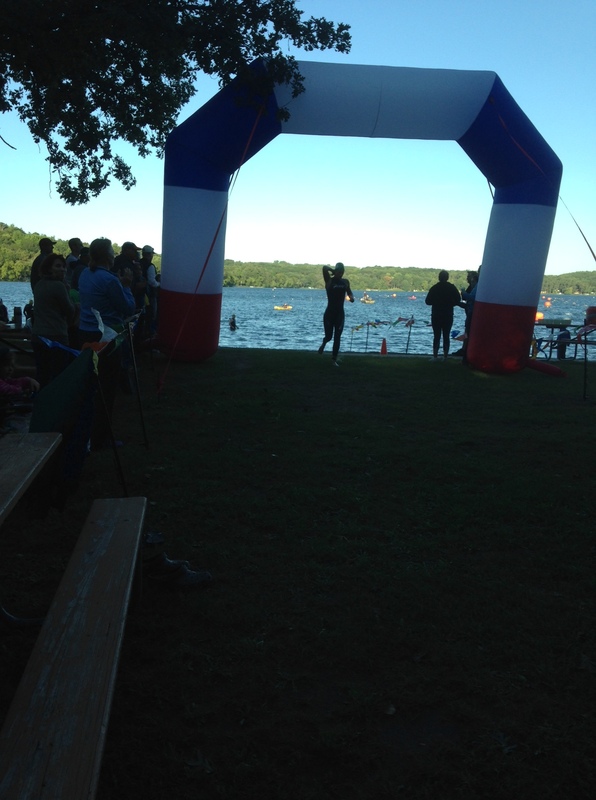 With tons of cheers I did my best to sprint down to the lake to the finish. Gear West Teammates Brett Lovaas, Tony Schiller and I filled out the podium. I crossed the line still in first and I was 2:21 faster than the previous year. I was happy to see my swim was faster, according to my GPS the swim was .52 to the mat, so the course seemed very accurate. My bike was a bit slower, but with the work my legs did that week I wasn’t too disappointed. My run split may have been the best of the year, 6:24 pace for 5 miles after a 16.5 mile bike, I was thrilled with that improvement. To make the day even more fun my sister, Lisa Lendway, crossed the finish line in second. We went 1-2 for the second time this year. After a quick cool down swim with Lisa, we hung out for awards. The awards at Square Lake are my absolute favorite, a coffee mug! I know I’ve said it before and I’ll say it over and over: I absolutely love a useful prize. 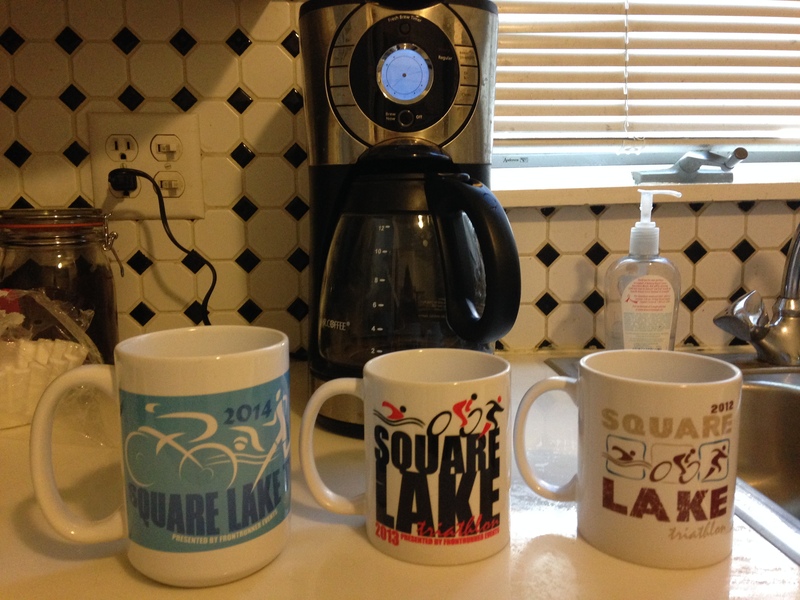 I now proudly own three Square Lake coffee mugs. 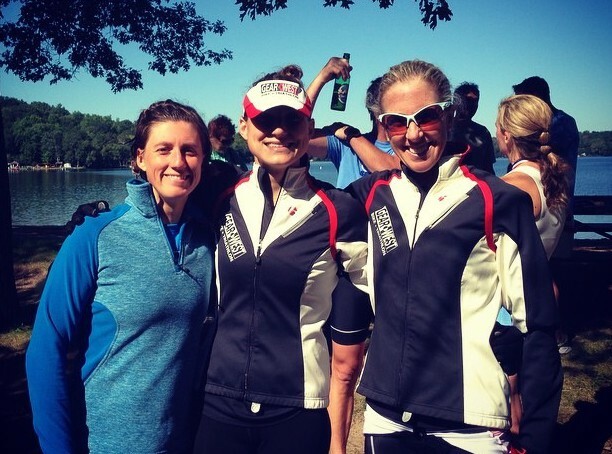 Lisa, Gear West Teammate Julia Weisbecker and I, top three ladies. If you haven’t raced Square Lake I highly recommend you try it! Thanks for reading, hope to see you out at some of the end of season events. 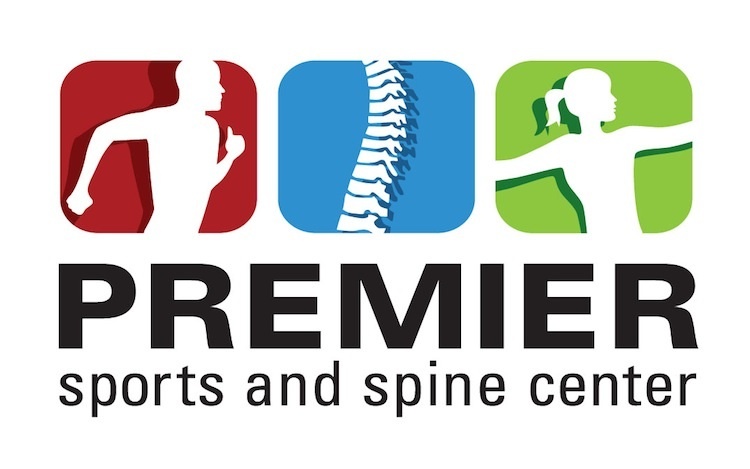 Happy and safe training as you finish off your season! Check out the race results.